Have you ever heard about the crazy Easter customs in Slovakia which include guys pouring a bucket of cold water on girls and getting money or chocolate in return? Keep reading and all secrets will be revealed! But before we get to the part where we discuss the true origins of the well-known “Ice bucket challenge“, let’s put you in the picture about the basic traditions of a Slovak Easter. Easter is the most significant Christian holiday. 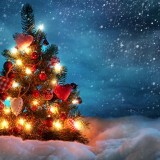 Because it is a moveable holiday, its date changes every year. In Slovakia we celebrate Easter for 5 days – from Thursday until Monday. Every day has its name and importance: Holly Thursday (Green Thursday); Good Friday (Big Friday); Holy Saturday (White Saturday); Easter Sunday and Easter Monday. 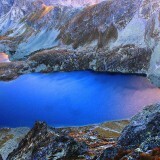 Prior to the Easter we have 40 days of fasting which end on the Good Friday. During these days people should avoid meat. Good Friday is the biggest fast days of all. 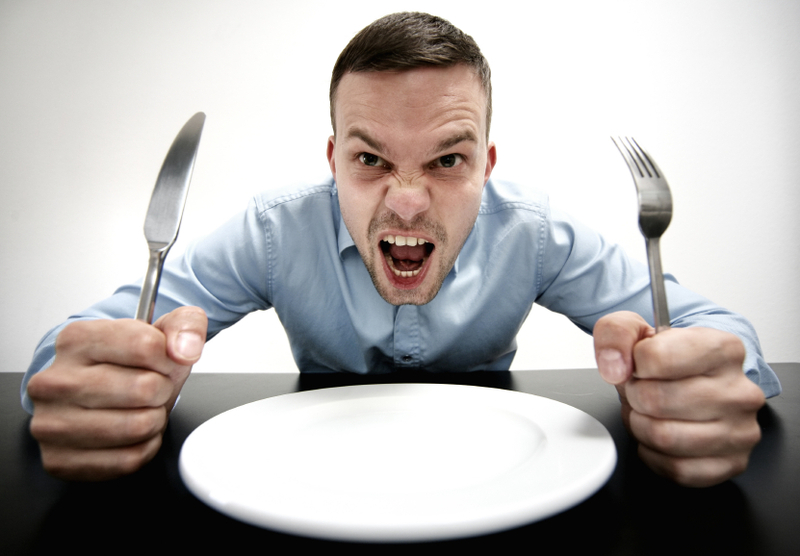 You can also do a symbolic fasting during which you stay of something you really enjoy – chocolate, alcohol, cigarettes, or favorite pc game. 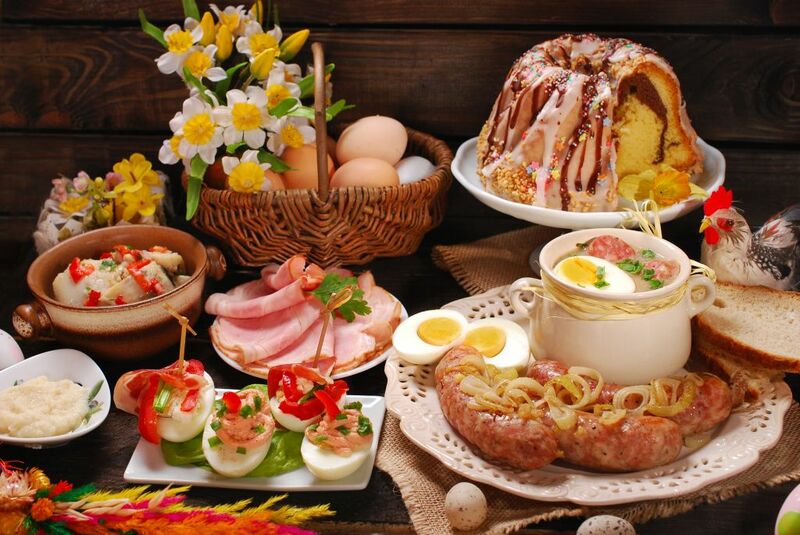 As any other Slovak holiday, Easter is also connected with the specific dishes, drinks, habits and superstitions. Preparations for the biggest day of the year starts on Green Thursday. Ladies in the house are busy cooking and baking all types of the Easter goodies. The foods most typical for the Easter are Paska bread, egg cheese – Hrudka, smoked pork ham (of lamb), bacon and sausages, hard boiled eggs and various pastries. Who cooks what and how is really different in every family. Most of the times it’s mothers teaching their daughters the secret recipes. The daughters adjust them a bit and introduce them to the new generation. Same dishes have different names based on the region. On White Saturday, housewives take a sample of everything they have prepared, put it in the wooden basket and go to church to get their work blessed. Blessing of the Easter Food Baskets on Holy Saturday or Easter morning is a tradition among Roman Catholic and Orthodox Christian Central and Eastern European nations. Food from the basket can’t be eaten until the Easter Monday and it traditionally becomes Easter breakfast for the family. Typical basket should include Paska bread, egg cheese – Hrudka, smoked pork ham (of lamb), bacon and sausages, butter, hard boiled eggs, various pastries bottle of wine, bit of salt and candle that gets lighten up during the blessing process. Before we move to the actual Easter habits Slovaks practice on Easter Monday, I have to mention our Easter decorations. To decorate your house before Easter is equally important like the cooking. It’s mostly women who decorate. 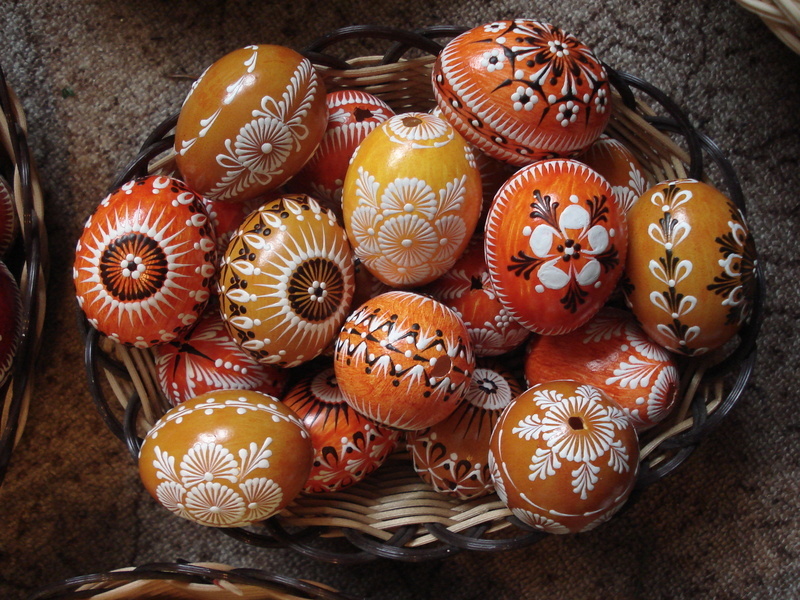 Symbols of Easter in Slovakia are lamb, small bunnies, little yellow chicks and painted egg shells called “kraslice” (sg. kraslica). Baby animals are pagan symbols of spring and new life – end of night and beginning of day (end of winter and beginning of the spring). Kraslica is an eggshell with two small holes on the two sides of it. The egg inside has been blown out of the shell. The techniques for decorating the eggs are different: the ornament is drawn with melted wax, the egg is then painted, the wax melts and then on the color background there is a white ornament left. To master this skill you need to practice. Today it’s mostly our grandmothers who decorate eggs in this way. When I was a kid, I painted my kraslice with the water colors and the final touch ups consisted of glitter. There are two more flowers, rather bushes, and one tree associated with our Easter decorations and Easter itself. The bushes are called “zlatý dážd” (golden rain) and “bahniatka.” People collect the branches and put them in the water. Then they hang their kraslice and other decorations on them. The tree associated with the Easter is willow. 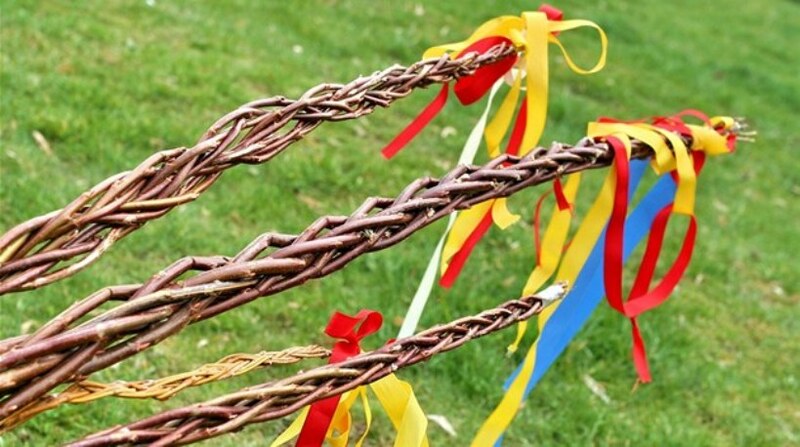 Men use willow branches to make “korbáč.“ They use it later on Easter Monday to whip single girls. Yes, I really meant to say whip. Easter Monday is considered to be the most important Christian holiday – the day of Christ’s resurrection. As a native born Slovak it has never crossed my mind that there is something special about the way we celebrate the Resurrection Day. It was the horrified looks of my foreign friends when I explained our habits. Every single lady needed to get splashed in order to stay healthy and beautiful for the whole next year. The tradition is most visible in the villages, where people tend to honor our national heritage more. Guys had to start very early if they wanted to go through the whole village until noon, because splashing in the afternoon wasn’t polite. They dress up in the national costumes and visit all their cousins, aunts, sisters. On the way through the village they have fun and sing. Once they arrive to the girl’s house, they pull out all the single women out of the house and splash them. Girls, obviously, put some fight into it, so the scene looks like two guys are hold a poor thing while the third, fourth, fifth, etc. splashes her with bucket of water (if they have some mercy they put warm water in). In the cities guys also visit their relatives. However they tend to move around in smaller groups and wear normal clothes. They don’t carry buckets, just very stinky perfumes J Some often just shower girl in the shower. After the oblievacka and sibacka, women reward men with sweets, fruit, money, painted Easter eggs, or ribbon for their korbac. While it is not required to give Easter eggs to visiting males on Easter Monday, only a few men will leave the house without a drink or small refreshment. I do not agree with this tradition being called humiliating. I know people who do not like it and therefore decide not to follow it. In the worst case scenario there is still the option of not opening the door. I can ensure everyone reading this that nobody will break inside somebody else’s residence and make them follow this tradition by force. Also please note, as I mentioned in the beginning, only good friends and family members visit each other nowadays, so it also cannot happen that random girl walking down the alley is attacked by “water thugs”. As you can see, it’s not the hidden Easter eggs and cute chocolate bunnies that make our Easter traditions so unique. Today’s Easter Monday divides people into two groups – those who love it (obviously mostly guys) and those who wouldn’t mind skipping all the fuzz around it (all the single ladies). Honestly, I don’t know who came up with all the whipping and splashing and why it’s so different from all the other Easter celebrations. It must have something to do with some old pagan customs Slavic people used to have before the Christianisation. Truth is that all the whipping and splashing is responsible for some of my greatest childhood memories which I am going to remember my whole life. And I guess it was worth getting a little bit wet. 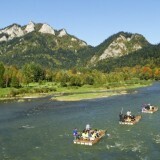 If you think you would like to know more about the traditions in Slovakia come and visit us! 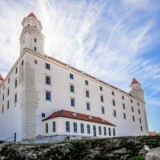 Take a look at the tour Folk Traditions; or plan your own tailor-made tour and learn more about this fabolous country!